In 1982, on Late Night With David Letterman, pro wrestling made a surprise run-in. Andy Kaufman — comedian, star of Taxi, and frequent Saturday Night Live guest — had been improbably feuding with Memphis wrestling star Jerry “the King” Lawler. The two had been at odds since Kaufman had shown up at Lawler’s regional promotion, calling the Mid-South crowd hayseeds and challenging women to matches, claiming to be the “Inter-Gender Wrestling Champion of the World.” It was a shtick he had worked in his stand-up act, and as a longtime wrestling fan (and committed meta comic), Kaufman was desperate to take the gimmick to the actual ring. Before Lawler, Kaufman had pitched the stunt to Vince McMahon Sr. — head of the promotion that would become WWE — and McMahon turned him down because he feared that letting a skinny comedian participate would delegitimize the pro wrestling enterprise. When Kaufman finally brought his provocative routine to Memphis, it caught fire immediately. He professed to be from Hollywood and sneered at the bathing habits (or, he implied, lack thereof) of the Memphis fans. Eventually Lawler grew tired of Kaufman, got the comedian in the ring, and dropped him in back-to-back piledrivers that left fans in the packed Mid-South Coliseum screeching in delight. Kaufman left the arena in an ambulance. When Lawler and Kaufman appeared on Letterman to bury the hatchet, the host probably thought he was booking an offbeat comedy bit. What he got was something totally different, but to wrestling fans something familiar — the two sat side by side and awkwardly sniped at each other, until Lawler eventually stood up and smacked Kaufman out of his chair. Kaufman launched into an expletive-laced monologue that nearly got him banned for life from NBC. Letterman was visibly shaken. It was a singular mainstream moment in pro wrestling history — because of the platform, because of the cool factor of both Letterman and Kaufman, and because of the legitimacy engendered by Lawler’s slap. If judged by staying power, it belongs among the top 10 moments in wrestling pop culture history. Critics regarded this appearance as the epitome of Kaufman’s brilliance. They thought it was a postmodern comedic performance. But it really was an early-era worked shoot. This wasn’t an innovation as much as it was Pro Wrestling 101. But Kaufman did accomplish something important — he showed the wrestling business the path to widespread popularity. WWE, which has spent much of the subsequent decades chasing mainstream press and approval, missed out on its chance to hit the jackpot when McMahon Sr. declined Kaufman’s pitch. And while it’s easy to dismiss WWE’s chase for pop-culture attention as a case of misplaced priorities, many of wrestling’s most iconic moments involved celebrities. And the instances when wrestling has been at its coolest, most popular, and most socially acceptable? Think about who was involved: Kaufman, Mr. T, Mike Tyson, Jon Stewart. But wait, you say. Stewart was on just a couple of weeks ago. Exactly — it’s starting to feel like we’re back there again. Sometimes radio stations call me to do interviews. It happens when wrestling is in the news — when wrestlers die or get arrested, or during the week of WrestleMania. It happens on slow news days on sports radio stations in cities that had vibrant wrestling territories back in the day. Lately, though, it’s been happening for another reason. People want to talk about why wrestling is popular again. When I started writing for Deadspin, “mainstream” sports outlets wouldn’t cover pro wrestling at all. The most common comments were, “You know wrestling is fake, right?” and, “Why are you running this garbage?” By the time I started writing for Grantland, though, I could feel attitudes shifting. Wrestling articles were published in The New Yorker and The Atlantic, and a wrestling essay just made Best American Sports Writing. Sports Illustrated and Rolling Stone have regular wrestling beats now. Deadspin’s wrestling writing these days is often republished from Jezebel and Kotaku — Gawker Media’s partner sites on women’s issues and gaming, respectively. The environment for wrestling writing is wide open and thriving. Wrestling fans used to joke (or complain) that sports outlets cover wrestling only when somebody dies. For years, that was true. But now ESPN covers WWE events with the same interest it once reserved for wrestling tragedies, even if the network doesn’t report wins and losses as fact. Brock Lesnar showed up in Bristol to hype WrestleMania and SummerSlam this year, and SportsCenter broadcast live from the site of SummerSlam on the day of the event. So why has the media executed such a dramatic turnaround in its regard of the squared circle? Some of it can surely be attributed to the impulse to follow what others are doing — one radio station thinks wrestling is popular again because another station covered it first. And many outlets appear happy to cover wrestling once they’re given the cover of others doing it before them and proving there’s an audience. But is wrestling actually more popular now, or has the media just learned to accept sports entertainment for what it is? WWE’s numbers say that the growth is real. Contrary to some early fears (mine included), the WWE Network is earning more money at $9.99 a month than the old pay-per-view model was making at about $50 per show. According to their second-quarter earnings report, the WWE Network plus standard PPV revenue generated $131 million in the 12 months prior to June 30. Annual PPV revenue between 2003 and 2013 ranged from $70 million to $95 million. And thanks largely to the network, more people are watching the PPVs: According to Matthew Altman, WWE’s senior director of communications, WrestleMania 30 reached a million households in the U.S. for the first time (on WWE Network and pay-per-view combined), and WrestleMania 31 hit 1.6 million homes globally, which is WrestleMania’s biggest audience to date.1 According to Altman, average PPVs2 were typically seen in 300,000 to 400,000 homes prior to the network, and now each is seen in more than a million. If there is a real bump, where is it coming from? Some of it is cyclical, to be sure. Fans who grew up in the ’80s and ’90s now have money to spend on wrestling, and have children to turn into a new generation of fans. There’s also a recurring technological trend, as wrestling’s high points have traditionally come at moments of television expansion — national broadcast TV in the ’50s, cable TV in the ’80s, massive cable expansion in the late ’90s (which meant enough space on the airwaves for multiple shows on competing channels). Now we have Internet streaming television, and the WWE Network is at the forefront of generating a new model of viewership. It’s undeniable that nerdiness has transformed from a stigma into a badge of pride in today’s pop culture, where everything is a potential source of nerdiness. You don’t have to look hard to find NFL nerds, beer nerds, hip-hop nerds, or car nerds. Most of the perceived sources of nerd antipathy have become outlets for people to express their idiosyncratic commitment. And the Internet has made it easier than ever for nerds of all stripes to commune with like-minded people — and to realize that there are others in the world who share their fascinations and obsessions. Some bastions of nerdy subculture might still be filled with awkward teenagers, but now they’re sharing space with the rest of the breathing world. Avengers: Age of Ultron grossed $458 million domestically this year. Some 8.1 million people watched the Game of Thrones season finale. This is not the geekdom of yesteryear, and the stigma attached to wrestling fandom has diminished as it has with other traditionally nerdy subcultures. About that stigma. There’s one line that wrestling fans have had to endure throughout their lives: “You know that stuff’s fake, don’t you?” It is, and obviously so. In The Squared Circle, I traced social awareness of wrestling’s inherent falsehood back to the 1910s. Fans weren’t always in on the lie — not all of them, anyway — and promoters tried hard to maintain the appearance of genuine competition, but the idea that most of the audience hasn’t always been aware of what they were watching is absurd, especially once television put the pantomime punches onscreen. The first national star of the TV era was Gorgeous George, a wonderful undersize buffoon whose manufactured despicableness in the 1940s and ’50s was so obvious that only a child couldn’t see that the entire enterprise was similarly contrived. Years before, in 1934, a promoter named Jack Pfefer got squeezed out of his position in the New York wrestling scene, and so he went to the sports editor of the New York Daily Mirror and confessed that the whole endeavor was fake. Pfefer was famously open about the sport’s falsehood, once saying to A.J. Liebling, “An honest man can sell a fake diamond if he says it is a fake diamond, ain’t it?” Even if Vince Sr. had been mindful of the appearance of legitimacy in his dealings with Kaufman,3 his son would hew more closely to the Pfefer line than to his father’s. As Vince McMahon Jr.’s WWF laid bare the pretense of the sport, the slur endured. “You know that stuff’s fake, don’t you?” became a jab at the idea that anyone could enjoy a product so manufactured. But then came reality television. Now it’s impossible — or untenable, at least — to revel in the Real Housewives and sneer at pro wrestling’s falsehoods. Wrestling staged contrived contests years before The Challenge, and it had the audience voting on competitors via cheers decades before you could text in votes on American Idol. In the (real) sports world, great games are celebrated with lines like, “It couldn’t have been better if it had been scripted.” Well, pro wrestling specializes in endings that are too good to be true, and the mythmaking style from WWE promo packages has influenced the way the NFL, UFC, and almost every other professional sport promotes its talent. Which is all to say that big-time competitive sports have caught up with “sports entertainment.” Fifty years ago, Muhammad Ali modeled his public persona on Gorgeous George and became one of the most iconic athletes in history. Now executives across various sports and industries want to be Vince McMahon. The perception that wrestlers are just bodybuilders who’ve learned simple dance routines — a notion that the late-’80s WWF helped perpetuate — has been just about completely debunked, thanks to Brock Lesnar. When Lesnar, who had been an NCAA wrestling champion at the University of Minnesota before joining WWE, left pro wrestling in 2004, he was booed out of the ring for turning his back on the business. When he returned in 2012, fans welcomed him back because of all he’d accomplished in the intervening years. He tried out for the Minnesota Vikings with hardly any football experience and made a strong showing. When he didn’t make the NFL, he turned to MMA and in short order came to dominate the UFC’s heavyweight ranks, until a serious bout of diverticulitis cut his career short. 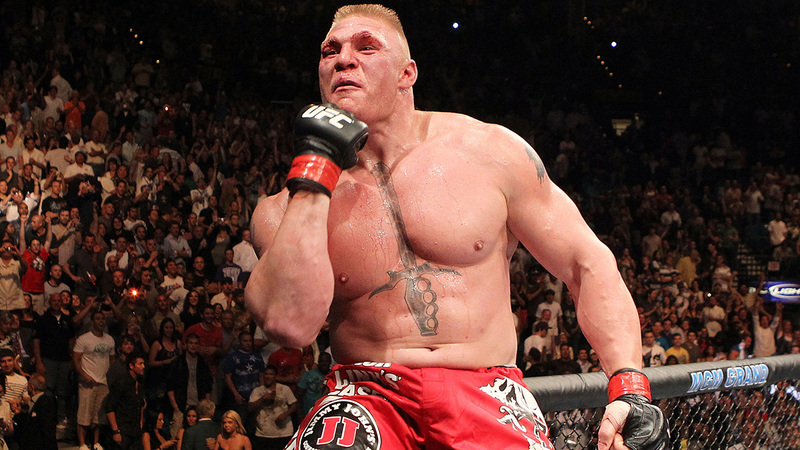 By the time Lesnar reappeared in WWE, he carried the imprimatur of a real champion fighter. Every match that Lesnar has had since then has felt a little more real, either because of Lesnar’s unparalleled physicality or simply because sharing the ring with him lends prestige to his opponents. No one has to believe that John Cena could be a world-class MMA fighter for that transference to occur; fans just have to understand that the action in the ring is a legitimate, professional athletic feat. Just as Lesnar’s foray into the UFC octagon helped the perception of the physical side of wrestling, so did Dwayne “The Rock” Johnson’s career in Hollywood help to buoy the acting side of WWE. It’s easy to watch pro wrestling and see only hammy machismo and overcooked emoting, but that underestimates the performers. What wrestlers do isn’t normal TV acting but rather a throwback to classical theater, when performers wore giant wooden masks to convey emotion to the back row — with booming WHOOOs and swooping roundhouse punches in place of the masks. In the most recent period of pro wrestling’s mass appeal before this one, the late-’90s Attitude Era, the WWF star who took that back-row projection to soaring new heights was the Rock. Before wrestling, he was a backup defensive tackle at the University of Miami and tried to make it in the NFL, but eventually he ended up a wrestler, like his father and uncle before him. Rough as his early efforts were, he quickly developed into a timeless star, until, like Lesnar, he decamped for greener pastures. For the Rock, however, his goal was not a return to competitive sports but to a career in Hollywood, where his good looks and post-human physique quickly cast him as a new generation’s Arnold Schwarzenegger. Much like in his early wrestling days, his first few outings were uncertain, but eventually, by dint of discerning selection of roles, his commitment to the craft, and amazing PR, he developed into a movie star. By adapting his in-ring bombast to the big screen, the Rock proved that wrestlers were talented actors in their own right. 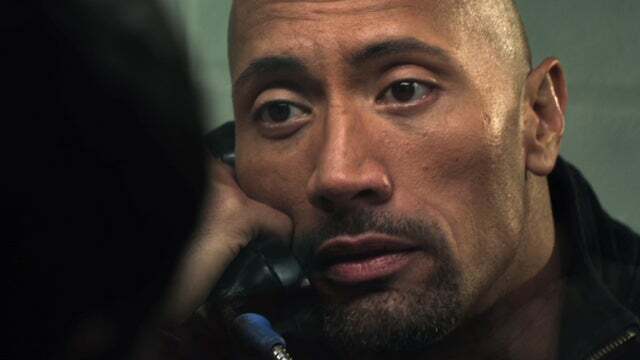 When he returned to WWE in 2011, the Rock brought with him not only that greater cachet but also a sea of action-flick fans who realized that there wasn’t much difference between an onscreen car crash and an in-ring highspot. But the Rock’s success where others, like Hulk Hogan, had failed proved that wrestling acting is a totally different animal from Hollywood acting. Just watch when Hollywood stars agree to be worked into WWE story lines to promote new movies — they look ridiculous, corny, and lost. If in-ring acting were a lesser art, the Hollywood pros would be able to adapt, but instead they’re adrift. “Hollywood acting” and pro wrestling acting are different beasts, but one is not inherently inferior to the other. Nor is the athleticism found in wrestling lesser than the athleticism in “real” sports. What the Rock and Lesnar did was bridge those divides. The Hollywood crossovers that work best occur when the visiting stars are legitimate wrestling fans who have internalized the style at a young age. Main eventers like Mr. T, throwaway hosts like Seth Green, timeless stars like Andy Kaufman — they were successful because they knew exactly what they were getting into. Last month at SummerSlam, two different celebrities took part in matches — longtime wrestling fan Stephen Amell (who plays the Green Arrow on television) performed capably in a tag match. And in the semi-main event, Jon Stewart, recently retired from The Daily Show, intervened in the closing moments to hit John Cena with a steel chair and ensure victory for Seth Rollins. The media attention garnered by Stewart’s inclusion was enough to justify the disappointment many fans felt in the moment. And the next night on Raw, when Stewart got his comeuppance (an Attitude Adjustment) about 50 feet in front of me, the entire angle was vindicated in a moment of Kaufmanesque shock. My initial response mistook the SummerSlam schmoz as a futile attempt at goosing WWE’s ratings, but after Monday night, it was clear that something else was afoot. Stewart wasn’t playing a mere Raw guest host. He was playing a pro wrestler. It doesn’t demean the craft to say that any more than it did to speak of Kaufman that way — or than it does to acknowledge that Bobby Heenan and Paul Heyman have been as integral to the product as any grappler. There’s no more ignoring the talents of the wrestlers. There’s no more stigma about nerdiness in general or wrestling in particular. There’s no question about whether or not pro wrestling is fake. Just like Jack Pfefer said, it’s a fake diamond. And as long as you know the deal, there’s no shame in selling — or buying — a fake diamond. It wasn’t. The thing people miss about Kaufman’s turn as a wrestling villain was that he wasn’t working on a meta level or deconstructing the art form. He wasn’t playing a comedy routine in the midst of a wrestling show. It wasn’t performance art. He was being a pro wrestler, full stop. In a different way, so was Stewart. And the Rock will be, too, when he makes his next comeback. And so is Lesnar every time he steps in the ring. They’re all performing in different ways — doing things that a non-wrestling audience doesn’t always understand and that other actors and athletes can’t do. And it all adds up to an incredible show. That’s what’s great about wrestling. And that’s why wrestling has always deserved to be so popular. Maybe it seems so popular now because people are finally starting to figure that out. TV ratings are measured in viewers, while the WWE Network (and PPV) measures in households, so it’s a safe bet that this is an underestimate of the number of people actually watching. 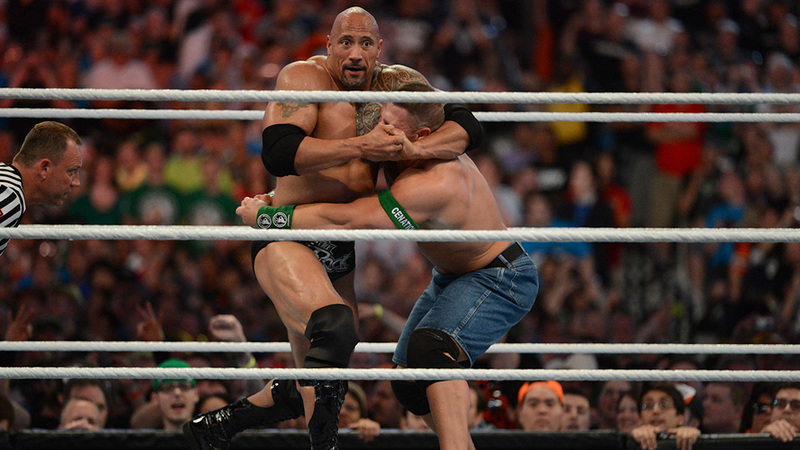 WrestleMania was much higher, and some smaller events were lower. It’s worth mentioning that Vince Sr. was less discerning in his early days as a Washington, D.C., promoter, when he was fairly honest with the local press about the reality undergirding his promotion. Though the Internet has certainly helped to get wider exposure for some of the best wrestling in the world: New Japan, Lucha Underground, Ring of Honor. Some experts say that working a wrestling match is like playing the offensive line in a football game. Wrestlers do that 300 times a year. Think about that the next time the NFL and the Players Association go to war over expanding the schedule.